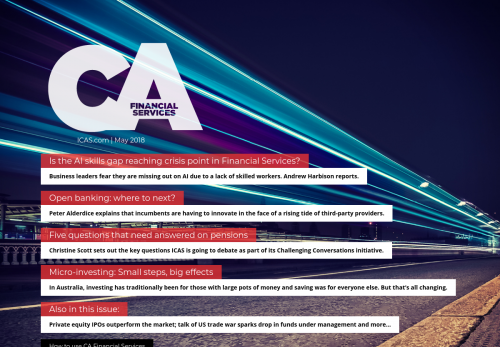 Is the AI skills gap reaching crisis point in Financial Services? Business leaders fear they are missing out on AI due to a lack of skilled workers. Andrew Harbison reports. Open banking: where to next? Peter Alderdice explains that incumbents are having to innovate in the face of a rising tide of third-party providers. Christine Scott sets out the key questions ICAS is going to debate as part of its Challenging Conversations initiative. In Australia, investing has traditionally been for those with large pots of money and saving was for everyone else. But that’s all changing.